Wander through the heart of Old Delhi, head to Rishikesh to study yoga at it’s ancient source, admire the glorious marble structure of the Taj Mahal, see a tiger in the wild at Ranthambore National Park, go trekking at a cool and peaceful hill station or lounge on the tropical beaches of Goa. There is so much to explore in India. India can be a little bit intense at first – with its chaotic streets, sweltering heat, riot of colours and fragrant and spicy cuisine. It can take a few days to get used to navigating around, but once you embrace the frenetic energy here you’ll be swept away on a wild adventure. India is home to some of the most awe inspiring artworks man has created, truly stunning natural scenery, sites of powerful spiritual significance, ancient festivals and much more. Plus, the people will welcome you with a warm and friendly hospitality. On our luxury tours of India we will make sure that you see the highlights of this fascinating country while travelling in style. We will set you up with high quality accommodation every step of the way and make sure that you are well taken care of by your friendly and helpful local guides. To find out more about our experiences in India, please contact us today! When is the best time to visit India? It depends on the region you plan to visit and what you intend on doing while you are there. Overall, the best time to visit India is between late October and mid-March. If you visit during April and May the weather can be overwhelmingly hot and humid, although this can be a good time to visit the cooler hill stations of Darjeeling and Shimla. The monsoon season will begin in late May in the south and will gradually move north over the following six weeks. This season brings long downpours with short bursts of sunshine and can even sometimes bring landslides and flooding. India is a huge country with so much to see and do that it’s impossible to cover it all in one visit – it would take a lifetime to fully savour it all. You can admire the gorgeous stone carvings at the cave temples of Ellora and Ajanta, visit an ashrama retreat, shop at a labyrinthine bazaar in Old Delhi and watch the ritual prayers along the banks of the Ganges. Mumbai is an exciting city where skyscrapers mix with ancient temples and India’s hill stations (Darjeeling, Shimla, Ooty, etc.) are British-styled outposts in the cool and misty mountains. You can go roaming through Rajasthan and take a camel safari into the Thar Desert to experience what life was like in India’s past. Soak up the artistic atmosphere in Kolkata or go camping in Jaisalmer under a sky full of stars. 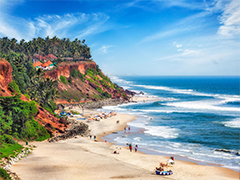 If you want to soak up the sunshine India has several superb beaches to kick back on, especially in Chennai, Goa and the Andamans. If you are interested in finding your spiritual side you can go on a retreat to Leh, Ladakh and visit some of the Buddhist monasteries that overlook the inspiring scenery. 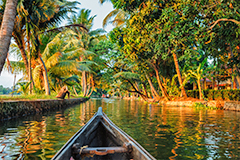 Head to the peaceful backwaters of Kerala, where you can take a rice boat cruise past paddy fields, rural temples and shady palm trees. India has so much to explore and discovering its hidden secrets is an unforgettable adventure. Our packages are all inclusive, so every detail is taken care of and any experience you want to have in India can be easily arranged – just let us know! Unless you are from Nepal or Bhutan you will need a tourist visa to visit India. The duration of the visa depends on where you are from and the visa will be valid for multiple entries. Your passport should be valid for at least 6 months after your entry. You can obtain a 30 day tourist e-visa online. The online application form is detailed and cumbersome, so allow yourself enough time to complete it. You will also need to upload a photo of yourself and a scan of the first two pages of your passport. The e-tourist visa application should be submitted several days ahead of time. It is important to watch out for petty crime, pickpocketing and theft, as you would in any country. Count your cash before handing it over to shopkeepers and make sure that you have received the right change back. Avoid giving money to beggars in public, as it will cause a swarm of beggars to follow you. Also, giving money to child beggars doesn’t help them as they are likely being kept out of school and exploited by adults. The money you give only continues to fund the system that is exploiting them. Female travellers should be careful when travelling alone at night and should dress conservatively. Taxis and rickshaws are the most likely situations when you will get ripped off, so insist that they use the meter rather than a flat rate. Also, be wary of strangers who offer you services, travel advice and assistance. If a “helpful” person approaches you out of the blue to give you travel advice or offer you something, it is likely that they have an ulterior motive or they are setting you up for a scam. Unclean food and water might cause traveler’s diarrhea and other issues, so avoid food that is served at room temperature, unwashed fruits and vegetables and tap water. Look for food vendors who cook the food as you order it and serve it hot – and drink only sealed bottled water. Before travelling to India you should be vaccinated for Hepatitis A and Typhoid. Depending on how long you are staying and what you will be doing, you might also want to be vaccinated against Japanese Encephalitis, Rabies and Hepatitis B. The official currency of India is the Rupee. You will not be able to obtain Indian currency outside of India and you cannot carry rupees outside of India’s borders. The best exchange rates are at the ATMs and you might want to avoid exchanging money at commercial exchange bureaus as they will have high transaction fees. Carry plenty of small bills for tips and because some shops will not have change for larger bills. Our India tour experiences will offer you an experience of a lifetime. To learn more about India and to book one of our fantastic tour experiences, please contact us today!